The Fourth National Climate Assessment, published on November 23, reviewed the latest science on human-caused climate change in the United States. UC Berkeley scientist Patrick Gonzalez led the regional assessment for the Southwest as Coordinating Lead Author. The assessment is the official US Government report on the state of climate change in the country, aimed at providing the latest published science to help decision-makers and the public plan for the future. 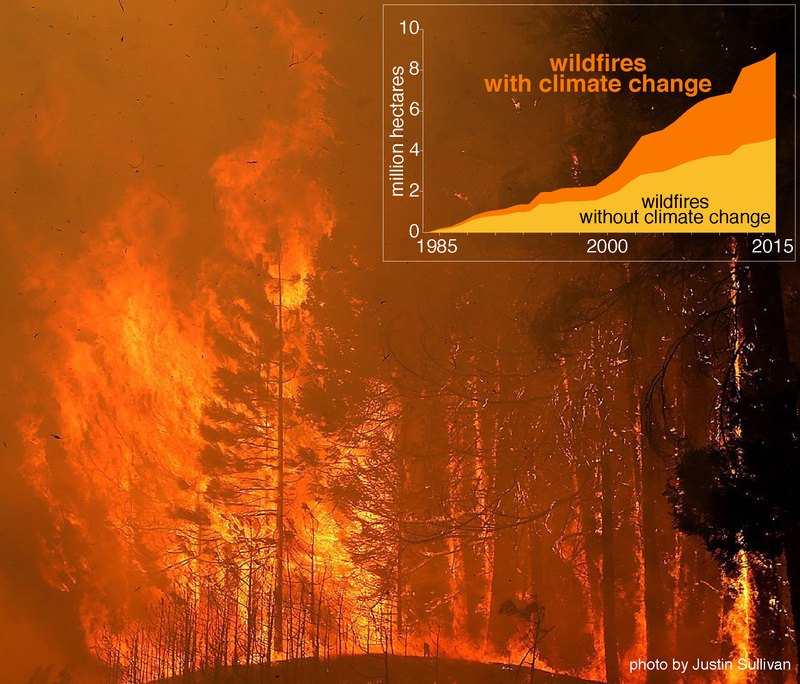 Human-caused climate change doubled the area burned by wildfire in the western United States from 1984 to 2015 compared to what would have burned without climate change (Abatzoglou and Williams 2016 Proceedings of the National Academy of Sciences, Gonzalez et al. 2018 US National Climate Assessment). Here, the Rim Fire burns west of Yosemite National Park, August 21, 2013 (photo by Justin Sullivan). Gonzalez, associate adjunct professor in the Department of Environmental Science, Policy and Management and a PhD alumnus of the Energy and Resources Group, led a team of 14 authors who assessed the scientific literature. They found that human-caused climate change has caused or aggravated severe impacts in the US Southwest, including deaths of people in heat waves, a doubling of wildfire, droughts in the upper Colorado River Basin and California, a doubling of tree death, sea level rise, ocean warming, and ocean acidification. These impacts have caused water scarcity for farms and cities, post-fire erosion and flooding, reduced hydropower and increased greenhouse gas emissions, and economic damages. The assessment shows that cutting carbon pollution from cars, power plants, and other human sources can save people and nature from the most extreme heat. The US Global Change Research Program has invited Gonzalez to present the ecosystem results for the entire National Climate Assessment on December 11 at the American Geophysical Union Fall Meeting in Washington, DC.